There’s going to be an awful lot of people Searching for new heroes when the month of March comes to a close. March 31 will be the day The Searchers play their very last gig, after 57 years of recording and touring. With their retirement will come the end of an era, as founder John McNally, singer and bassist Frank Allen and the rest of the band take their last encore. In their time, they have played for the Queen, backed Cliff Richard in front of 80,000 people, had Marvin Gaye as their support act, competed head-to-head with The Beatles and toured with The Rolling Stones. We caught up with their two main men, John and Frank, to discuss how they’ll cope with retirement, and to describe what it’s been like for the band who gave us Sugar & Spice, Needles & Pins, When You Walk In The Room and countless other favourites. “I had a stroke a while back,” reveals 77-year-old John McNally, “but now I am hopeful I’ll soon be able to get back to playing five-a-sides again! “But I’m not sure how I will cope with stopping performing. I’ve not got to grips with it yet and it’s very hard when you’ve done it so long for it to come to an end. “I’ve always been on the road and this will be alien to me. As for going solo, I just can’t see myself lugging amplifiers into clubs at my age. When you’re 77, your mind thinks you can do it but your body can’t. “When I started out, I just thought about making enough to buy a house and a car. We all thought the same way, and each new generation thinks like that. So did the record company, who worked us very hard. “In fact, by 1966, we got the cars, including me, even though I couldn’t drive. The lads all bought cars and I thought: ‘Hang on, that’s coming out the band kitty, so I should buy one, too.’ It was £664, for a Cortina. “Nobody knew how to handle the finances back then. Nowadays, Coldplay and people like that have all that organised with lawyers and stuff. If that sounds a bit rock ’n’ roll, Frank Allen happily reveals that he never indulged in any of the wilder side of the music scene. “I didn’t drink until I was in my 30s, and even today it is incredibly modest,” he says. “I wouldn’t even know what to do with a joint, and drugs frighten the living daylights out of me. “I’m scared, as I might like it! “It’s like all those people who go: ‘You’ve got to try heroin once.’ Oh, no, you don’t. All the clues are there, with all the people who have killed themselves. At times, of course, booze and drugs played a part in the creative peak that was the 60s. Frank reckons those really were the heyday for British popular music. “I think so,” he says. “There was something special. The 70s were more lively with all that colour and the fancy clothes but I am so grateful our main hits weren’t in the 70s, because having to go on in platform boots and bare chests, well, I look on that with horror. Always a well-turned-out group, the band were actually quite revolutionary and experimental at times, trying things with their complicated vocal harmonies and jangling guitar sounds that have inspired many later stars. From Pete Townshend to Tom Petty, Bruce Springsteen to The Byrds’ Roger McGuinn, some of The Searchers’ tricks have been borrowed and built on. “After Needles & Pins, everyone thought we’d played 12-string guitars,” reveals John, who has some very tasty vintage guitars in his own collection. “Bruce Springsteen invited me over to Old Trafford cricket ground when he did a show there, and his guitarists Stevie Van Zandt and Nils Lofgren were there, too. “They asked me: ‘What 12-strings did you use on the record?’ I told them there were none! It was just a couple of six-strings and the reverb must have made them sound that way, creating an octave. “They said I must be joking but it’s true. In the end, I had to go out and buy a couple of 12-string Rickenbackers, because people always expect it now. I’ve got five now! Unlike many bands that go back to the dawn of the 60s, McNally’s group have always seemed a bit cooler to the hip generations that followed. But even he was shocked when Sire Records, a punk and new-wave specialist known for such acts as Talking Heads, The Undertones and Lou Reed, came in with a recording deal in 1979. “We used to do the university circuit, and Sire heard us and wondered if we were still recording. Seymour Stein, their founder, came to see us, walked in the dressing-room and said we should make an album. “It was The Undertones, Madonna and then us! And I remember The Ramones drummer wanting to get up and play Needles & Pins with us. As The Searchers have proved time and again – and it will dawn on us once they hang up their guitars – the oldies are often the best, and they will be sadly missed. 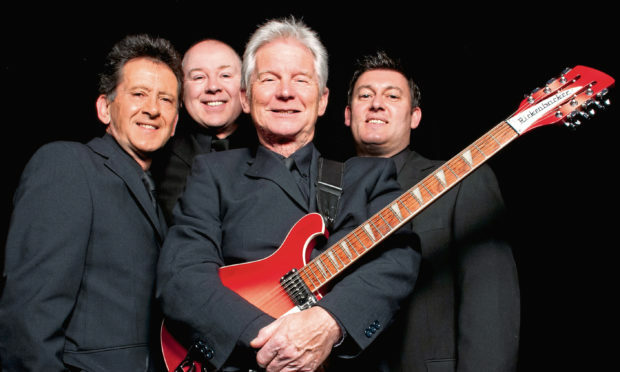 The Searchers final gig, which is sold out, is at Milton Keynes Stables on Sunday March 31. They play Glenrothes in a sold out show tonight and Motherwell tomorrow, with limited tickets still available.